When DogTime.com first told you about Gotti, a 2-year-old Pit Bull Terrier recovering after being dragged behind his owner’s SUV in Buffalo, New York, Daniel Delaney Jr. was fighting to reclaim his dog from a jail cell. Delaney initially sought to block the SPCA Serving Erie County from claiming ownership of Gotti, but after developments late last week, Delaney signed Gotti over to the rescue who’d been caring for the injured dog since early October. And Gotti, whose paw pads were completely shredded in the dragging incident, is now doing so well that SPCA officials were able to clear him for adoption Monday afternoon. A medical examination conducted Monday revealed that Gotti’s wounds are healing nicely, and the veterinarian gave the okay to finally take Gotti off of his medication. 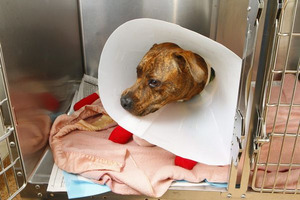 SPCA Serving Erie County Executive Director Barbara Carr said that, despite everything that he has been through, Gotti remains a sweet, happy pup, unfazed by his ordeal. Anyone interested in adopting Gotti can contact the SPCA Serving Erie County. Meanwhile Delaney is still being held on an animal cruelty charge after failing to post his $25,000 bail.